I’ll start this by saying I’m going off the path by reviewing this book. I don’t read non-fiction recreationally. In fact, I was required to read this book for a class I am currently taking. That being said I easily give Lords of the Horizons five stars because of all the non-fiction and textbook related literature I have ever read, THIS one keeps the attention, even plays with some humor, and doesn’t stop informing the reader until the final word and the book has ended. The subject matter doesn’t hurt, either. The Ottomans were wicked interesting. I have learned about the Romans and the Greeks and the Brits. I’ve learned about America and her relatively youthful history. I’ve learned about the Aztecs and the Incas. But never the Ottomans… why? I have no idea. They are ridiculously fascinating… if you can get the right book to catch your interest… like this one. There are some cons to this work, though, that I believe are negligible. The main one for me was the author’s tendency to skip around the eras from sentence to sentence rather than the book reading sequential. It made it a little confusing when I was trying to make heads and tails of who lived when and when what city was conquered by which sultan. Overall, I appreciate Jason Goodwin’s ability to present the information in an informal way. The language is easy to follow and he expertly avoids subject pretension. 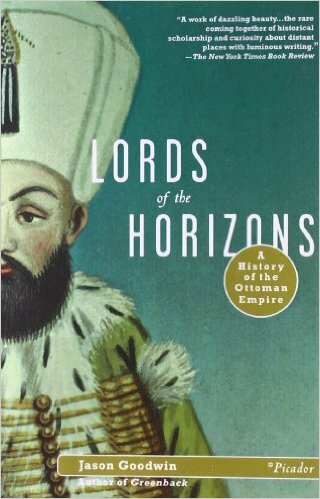 Even if you aren’t studying the Ottoman Empire, I highly recommend Lords of the Horizons. It’s equally entertaining and informative of a piece of our world’s history that is often neglected in the mainstream.